Sudanese protesters rallied against the new military council in Khartoum on Thursday evening despite army warnings it would enforce a curfew. PHOTO: AFP KHARTOUM:Sudan’s army has ousted veteran president Omar al-Bashir, but protestors against his iron-fisted rule denounced a ‘coup’ and thousands rallied outside army headquarters as a night-time curfew kicked in.In a sombre televised address on Thursday, Defence Minister Awad Ibnouf announced “the toppling of the regime” and said Bashir had been detained in “a secure place”, bringing an end to his three decades in power.Thousands of protestors were staging a sit-in for the sixth night running outside Khartoum army headquarters as the military council’s curfew began at 10:00 pm (2000 GMT) despite growing international pressure to hand over to civilian rule.Meet Alaa Salah, Sudan’s singing protesterThe army had earlier warned protestors not to defy the curfew. Washington said Khartoum should “exercise restraint and to allow space for civilian participation within the government”.“The Sudanese people should determine who leads them and their future and the Sudanese people have been clear and are demanding a civilian-led transition,” State Department spokesperson Robert Palladino told reporters.The European Union urged the army to carry out a ‘swift’ handover to civilian rule.Ibnouf said a transitional military council would replace the president for two years, adding that the country’s borders and airspace were shut until further notice.State television later broadcast footage of him taking the oath to become head of the council, alongside his new deputy, army chief of staff Lieutenant General Kamal Abdelmarouf.Bashir, who swept to power in a 1989 coup, was one of Africa’s longest-serving presidents and is wanted by the International Criminal Court (ICC) on charges of genocide and war crimes.Organisers of the protests that have rocked Sudan since December vowed to press on until the whole regime was swept aside.The protestors’ Alliance for Freedom and Change said the regime had kept “the same faces”, and urged demonstrators “to continue their sit-in in front of army headquarters and across all regions and in the streets”.Alaa Salah, who has become an icon of the protest movement after a video of her leading demonstrators’ chants went viral, said that “change will not happen with Bashir’s entire regime hoodwinking Sudanese civilians through a military coup”.Thursday’s announcement meant “we have not achieved anything”, said Adel, a protestor outside the army headquarters, where defiant demonstrators have braved tear gas and gunfire to keep up the sit-in.“We will not stop our revolution. 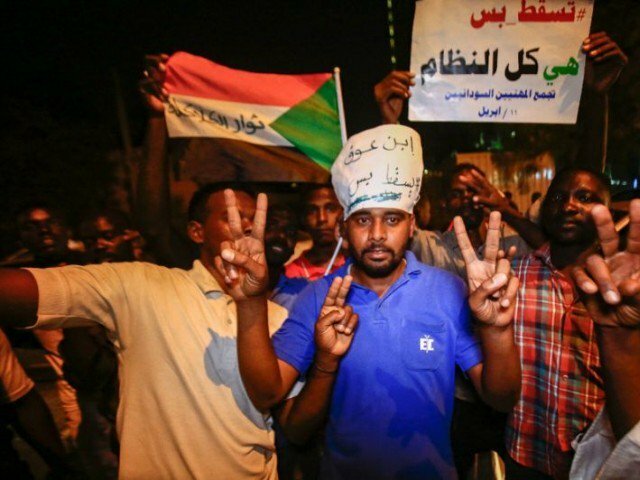 We are calling for the regime to step down, not only Bashir,” he said.Huge crowds of jubilant Sudanese had filled squares across the centre of the capital Thursday as the army promised an “important announcement”.Chanting “the regime has fallen,” they poured into the open ground outside the army base. But the festive mood later soured.“We are not leaving, we are not leaving. 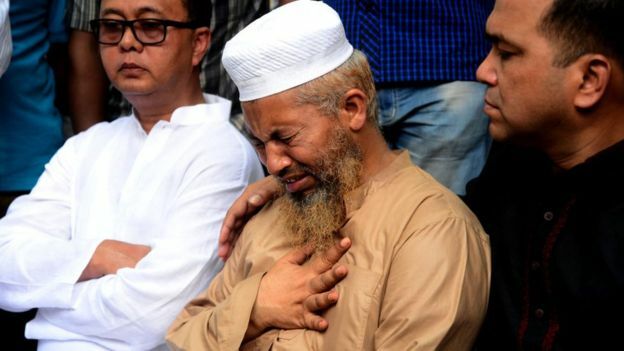 Just fall and that’s all,” they shouted after Ibnouf’s announcement.The opposition Sudanese Congress Party called for the establishment of a joint military and civilian council to rule for a four-year transitional period. It also urged the army to give executive powers to civilians.UN chief Antonio Guterres called for a transition that would meet the “democratic aspirations” of the Sudanese people and appealed for “calm and utmost restraint by all”, his spokesperson said.That came after the African Union decried Bashir’s military ouster, saying it was “not the appropriate response to the challenges facing Sudan and the aspirations of its people”.Sudan’s Omar al-Bashir in key datesArmy vehicles carrying troops were seen deploying across the centre of Khartoum from early Thursday.Troops raided the offices of the Islamic Movement, the ideological wing of Bashir’s ruling National Congress Party, witnesses told AFP.Martial music was played on state television as soldiers ordered the TV to halt its normal programming ahead of Ibnouf’s announcement. Outside army headquarters, dozens of joyful protesters earlyThursday climbed on top of land-cruisers and armoured vehicles that had been posted to protect them from intervention by other branches of the security forces.The military council also said it was declaring a ceasefire across the country, including in war-torn Darfur.But the rebel Sudan Liberation Army (SLA-AW) fighting government forces in Darfur denounced what it called a “palace coup”.South Sudanese rebel leader Riek Machar said in Rome he hoped the situation would be handled “peacefully so that the country can be stable”.He added that he hoped it would not affect the peace process in his country where a peace accord was signed in September 2018 to end a ruinous five-year war.Meanwhile, Sudan’s feared National Intelligence and Security Service (NISS) said it was freeing all the country’s political prisoners, state media reported.But in the eastern cities of Kasala and Port Sudan, the releases failed to materialise, prompting protesters to storm NISS buildings, according to witnesses.Demonstrators have since Saturday been camped outside the sprawling army headquarters complex in Khartoum, which also houses Bashir’s official residence and the defence ministry.Officials say 49 people have died in protest-related violence since the demonstrations first erupted in December.